← Congratulations Week 11-02-15 & 11-09-15 Giveaway Winners!! JENNIE MARTS’ Character, Zoey Allen!! 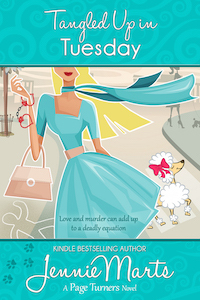 INTRODUCING….Character Zoey Allen, TANGLED UP IN TUESDAY by JENNIE MARTS. Zoey Shining Star Allen- I know, it’s so embarrassing. My mother is a hippie. She changed her own name to Moon. I just go by Zoey and very few people know my middle name. Although my mother uses it all the time. 2. Where were you born? Where have you lived since then? Where do you call home? I was born in Pleasant Valley, Colorado. My parents were living on a commune at the time, but my grandmother, Edna, insisted that they come to stay with her and my grandfather when she had me. Well, my grandfather at the time. Johnny is my grandfather now—but that’s a different book, er…I mean story. I was raised mainly on the commune, but I spent a lot of summers in Pleasant Valley with my grandparents. 3. What is one strong memory that has stuck with you from childhood? Why is it so powerful and lasting? I remember my mom and I spent a weekend with my grandparents and they took us on a road trip back to Kansas where they met. We went camping by the lake and my grandmother taught me how to catch lightning bugs in a jar. I’d never seen lightning bugs before, and Grandma Edna convinced me they were actually fairies. It was a magical trip—I’ll always remember it. 4. You’re getting ready for a night out. Where are you going? What do you wear? Who will you be with? Oh, gosh. For me a night out usually consists of going to the grocery store, so I’d most likely be wearing yoga pants. I’m pretty much a homebody. I like to read. I do date occasionally, usually men from the finance world in which I work…well, where I used to work…before I got fired a few weeks ago after I uncovered a money-laundering scheme. 5. Where do you go when you’re angry? What do you do there? Oh, usually if I’m good and mad, I drive up to Edna’s. My grandmother can usually cure just about anything that ails you. She’s great to talk to, and we usually end up doing something fun and by the time I leave, I always feel better. 6. Have you been in love? Had a broken heart? Who was it and what happened? I don’t know for sure. I met this really cute cop. His name is Mac. I wouldn’t go so far as to say I’m in love with him—not yet, anyway. But he does make my heart race and I feel all tinglie and nervous when I’m around him. He’s ridiculously good-looking and his muscles- oh my gosh—is it getting warm in here? 7. What is your biggest fear? Who have you told this to? Who would you never tell this to? Why? Right now—my fears are all centered around the dead body that was just found in my apartment and the two men who were sent to kill me. I’ve really only shared this with Mac and my grandparents and my grandma’s book club, the Page Turners. But they’re helping to solve the case-so that’s okay. I’m just not sure who else I can trust. 8. If you had to make a meal for me right now with only the ingredients in your refrigerator and pantry, what would you make me? Hmm- either a microwave Lean Cuisine or an omelette. I usually have eggs and cheese. 9. Look down. Describe what you’re wearing. Is this the way you’re normally dressed? If not, what do you normally wear? Right now I’m wearing my workout clothes because I had to flee my apartment in my pajamas in the middle of the night and this was all I could grab. I usually wear pressed pants or skirts, starched white shirts and sensible high heels. Right now, I just want my normal, calm, orderly life back. The one where things make sense and fit into neat, tidy cubicles. I can’t handle all of this chaos of dead bodies, and my co-worker being stabbed, and running for my life with a handsome cop. Well—I can handle the handsome cop part-although he worries me too. I don’t know how to fit him into my orderly life, but I don’t want to let him go, either. I just want my life to be normal again. Be sure to come back to read more about Jennie, Zoey, and TANGLED UP IN TUESDAY on Wednesday’s Karen’s Killer Book Bench. Happy Reading! Jennie loves to hear from readers. Follow her on Facebook at Jennie Marts Books , or Twitter at @JennieMarts. Visit her at www.jenniemarts.com. **SPECIAL GIVEAWAY**: The Page Turners book club loves to search for clues and romance while eating really great desserts. Tangled Up in Tuesday is the fourth book in the Page Turners series. With the holidays right around the corner, Jennie will giveaway an ebook copy of A Cowboy for Christmas–A holiday novella in the Page Turners series–to two readers who comment below with a favorite holiday tradition. Leave a comment below for a chance to win. Thanks, Jennie, for sharing your story with us!! My favorite holiday tradition is helping a local needy family. It is so fulfilling to be able to help those less fortunate and enforces the reason for the season. Good morning, Jennie and Zoey, and welcome to Karen’s Killer Book Bench! What a fun interview, Jennie. Thanks for letting me interview Zoey. She was fun. I can’t wait to read her story! Hi, Jennie! I have a really big family. We hire a hall for a Christmas party. We set up a tree and everyone brings food. We set up a table for the kids to do crafts. We give out presents and everyone has a ball. But the highlight of the evening, in my eyes anyway, is when we give glowsticks to all the kids. We turn out all the lights except for the tree, the adults all sit down, and the kids run around screaming and waving their glowsticks. We like this tradition so much that my grandson did it at his wedding reception! He and his bride stood in the middle of the dance floor in an embrace while the kids did their thing.